Our goal of providing a more modest option for fashion trends seems insignificant as we reflect on the devastation that many are dealing with now as the year comes to an end. The ugly truth is that we can patch up, cover up, and pretty up our face and our culture with programs and good deeds, yet not get to the root of the problem...(I'm not denying the VERY significant value of such.) But what we truly need is a love that is strong enough to work from the inside out. At Top Buttons we believe that the hope and restoration found in Christ Jesus is the only power strong enough to overcome the heartache of this world. We must help, love, show kindness, and serve each other as much as we are able to. For this shows the love of God to people in direct tangible ways. But we are not and never will be the Savior. There is only One that came to "seek and save," and only One with the power to do just that. (Luke 19:10). If we could save ourselves, God wouldn't have sent His son to this earth to die in our place for the redemption of mankind. This Christmas season, we are thankful that we don't have to earn our salvation, it's a free gift. If accepted, it is more than life changing. We can all attest to that. With that being said, we have much to be grateful for. The past two months have been a whirlwind as we have worked to create content that is note worthy, Christ honoring, and helpful for young women. We just had to get together one more time before the girls left to spend the holidays with their families in their homelands. 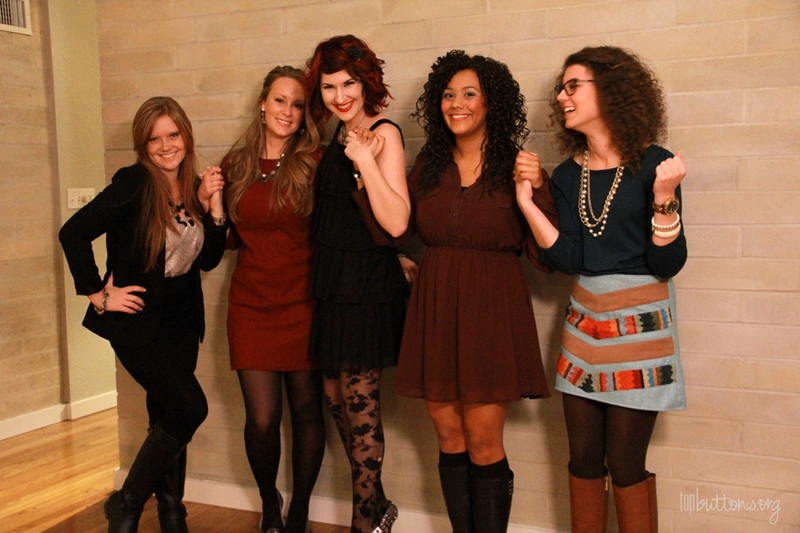 Here are some pictures from our TB team holiday soiree that we would like to share with you. This Christmas season, be inspired to dress with dignity and respect as you enjoy the company of family and friends. We'd love to welcome a new photographer onto the team! She is a budding teen with a passion for snapping photos and it has been a pleasure working with Elizabeth . Board Member, Katie Deloach (Middle), hosted our Christmas Party. We appreciate her hospitality! We will be on a blogging break for a week. Next year you will see more Modest Solutions posts, Video Tutorials, and also some NEW ELEMENTS to the Blog that will be revealed in January! Merry Christmas from the Top Buttons team. May your holidays be filled with love and peace no matter what you face this holiday season.